Landed on my arm and demanded a photo shoot. on Eucalyptus leaves in Heartwell Park in Long Beach, CA. I've been monitoring Eucalyptus over the past year or so for psyllids and this is the first time I've encountered this bug, but they were quite common at this location today. I didn't think it was anything special at the time so I released it after photographing, but if I need to send samples or notify anybody please let me know. I sent along an email with the precise coordinates, photos, and other data. We'll see what happens from here. Hopefully they have not become established; by my count this is the 12th Eucalypt pest that I've personally photographed in the county. 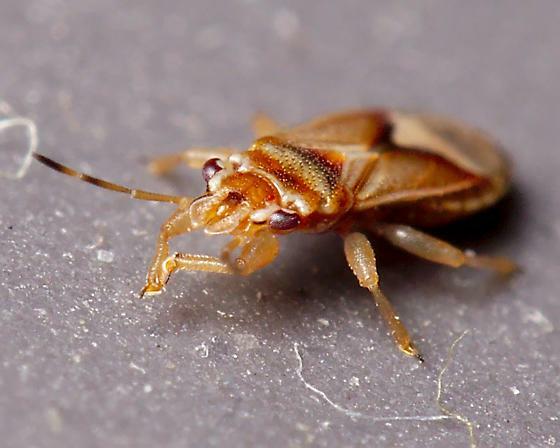 "We suspect that this pest will or already has become established. The site you've located them a may be closer to the original inoculation source than the previous sighting"
Based on this and based on the localized population that I found, I'm thinking we should move these into the guide. =v= made a page for it a couple weeks ago, here. ...but if it's there, it should have images, I reckon. Commencing move... welcome to California, bug! Placed here pending evidence of establishment. This is an invasive palm-feeding Thaumastocoris, and folks at CDFA/APHIS need to be notified. Is there an exact street address for this bug encounter? Sorry, brain fart. Eucalyptus-feeding, not palm. Presumably accidental, hopefully not well-established, but goodness only knows how urgently people might be about responding to quarantine the area if it's a small affected area. We have been introducing a number of biocontrols to combat non-native thistles, knapweeds, St John's wort, loosestrife, water hyacinth, etc. Why shouldn't we look at this insect as a eucalyptus biocontrol? Many thanks for the ID. I assume that you have reported, or will be reporting,the sighting. Correct? Placed here pretty much by the process of elimination. It's a distinctive little critter, but I'm not finding a good match. I've asked an expert to have a look, so with luck we'll have a name before too long. I especially found the structure of the eyes fascinating, would they maybe suggest Geocoridae? The slightly stubby legs make it seem baby-like to me... is this a general characteristic of juveniles, or am I just projecting anthropomorphic attributes where they don't apply? ...between the eyes that baffle me. I don't remember seeing anything like them before.